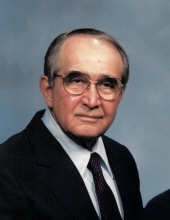 Charles Edward Marberry, 96, passed away Saturday, April 6, 2019. Charles was born on September 2, 1922 in Carbondale, Illinois. He was the middle child of three children born to James Ward Marberry and Minnie Ukulele Shinn; Charles was raised by his “other mother”, Eva Vey Artz as his biological mother died during childbirth of Charles’ younger sister. Charles obtained his undergraduate and Ph. D. degrees from the University of Illinois, Champaign-Urbana; both degrees were obtained with the highest honors and distinction as he finished in the top three percent of his class. In addition, Charles received his Masters Degree from Stanford University, once again with highest possible honors and distinction. Prior to entering college, Charles served in the United States Army Air Corps from 1941 through 1944. After completing his education, Charles entered the field of Academia and taught at the University of Arkansas, the University of Delaware and the University of Iowa. He was quick to point out that he was the only surviving World War Two Veteran that taught in the Business College at the University of Iowa. Charles met his wife, Dorothy, through a blind date set up by Charles’ best friend and his wife, who happened to be one of Dorothy’s sisters. After the dinner date, Charles informed his best friend, "I swear on a Bible that I am going to marry that girl." That prophecy came true on November 30, 1943 in Sana Ana, California while he was in the Army. They were stationed at various airfields throughout California during his service. The couple eventually settled in Iowa City, Iowa where Charles was a full professor in the College of Business Administration at the University of Iowa. In addition to teaching/educating, his first love, Charles was also a financial consultant and expert witness. His wife, Dorothy, was a stay at home mom and co-owner of a business that published cookbooks. The couple was very active in civic and social groups in the Iowa City area. Upon retirement from the University of Iowa, Charles and Dorothy permanently moved to their farm in Solon, Iowa. Charles and Dorothy remained very active in both civic and social groups, as well as, serving on the Board of Directors for the Solon Methodist Church. In addition, Charles among other things, became a fulltime ‘gentleman farmer’ and Dorothy remained the steadfast glue that held it all together. Everyone who had the opportunity to meet and interact with Charles commented on how incredibly brilliant, articulate and truly insightful he was. Although there was no topic that he was not extremely conversant in, he was for the most part, a very humble and unpretentious individual. He enjoyed the outdoors, working in his garden and ‘tending’ to his farm. Charles was generous with his finances and supported numerous charities, organizations and individuals. In addition to his biological children, Charles was very fond of and devoted to his other children: horses, dogs and an occasional cat. In their final years, Charles and his wife, Dorothy, lived at Legacy Pointe in Waukee, Iowa. Dorothy passed on October 2, 2017; they had been married for 73 years and eleven months. Thereafter, the staff at Legacy became Charles’ second family and his passing touched everyone who had the privilege of interacting with him. Everyone has shared their favorite memory or tale of “Charlie” who was quick to recite a poem, sing a song, tell a joke (some more colorful than others), engage in thought provoking conversations or just plain old chit chat. To a person, he truly touched, cared for and inspired those who took care of him; his passing left a significant void and the hallways at Legacy are now eerily quiet as Charles no longer traverses them day and night. Charles is survived by his son, Douglass (Janet) Marberry; daughter, Constance Marberry; grandchildren, Tyler Marberry, Samuel Naylor, Eli Naylor, Zoe Naylor; and great grandchildren, Hayden and Griffin Marberry. He was preceded in death by his wife, Dorothy; his daughter, Elizabeth Vey Marberry; son-in-law, Robert Naylor; parents and siblings. To send flowers or a remembrance gift to the family of Charles Marberry, please visit our Tribute Store. Donations can be made in Charles' name. "Email Address" would like to share the life celebration of Charles Marberry. Click on the "link" to go to share a favorite memory or leave a condolence message for the family.